Ubidots offers off-the-shelf widgets to cover most visualization and control needs for your IoT projects. However, in some projects you may want to code your own customized widget. Knowing some of our users have customization needs beyond our white-glove customer service we decided to open the possibility of users designing their your own HTML/CSS/JS code and creating their own custom widgets and visualizations. 1. How the HTML canvas widget works? 2. Example 1: Simple text with an image. 3. Example 2: Simple text box to set a variable. 4. Example 3: Highcharts – Line Chart. 5. Example 4: Mapbox Map. 6. Example 5: Plotly Graph. How does the HTML Canvas widget work? When you select the widget, you will find a code editor as depicted in the gif below. The widget works with the same HTML/CSS/JS you would code when creating a simple website. There's no need to learn a special API. It also consider the case when you may need to use a 3rd library (e.g. jQuery), so you can add these by inserting an URL containing the library. IMPORTANT NOTE: You should consider when writing code in this widget that all the execution will be made by your browser, we do not do any kind of polyfilling here, so it's up to your browser to support all the features that you make use of. 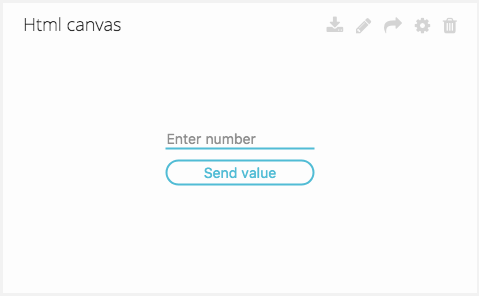 Following the below steps you will be able to create an HTML canvas widget with your own code. Step 2: Click on HTML canvas. Drawer menu displays setup options. Step 3: Name your widget. Step 4: Click on "Open editor" button. Step 5: Enter your HTML, CSS and JS code in the respective tab. Step 6: Add libraries by entering its URL in the "3rd party libraries section". Step 7: Save the changes. Below you will find example to create custom widgets and visualizations. For simplicity in explanations, these examples will use jQuery to manipulate the DOM. 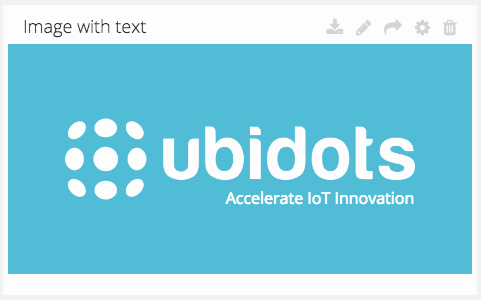 We're going to use the Ubidots logo and our motto which is "Accelerate IoT Innovation" to create this simple but gorgeous example. This example doesn't contain any JS code. You can see the result of this example in this widget here. Here you will need to add the jQuery library by copy/paste the following link in the "add 3rd party library" section. 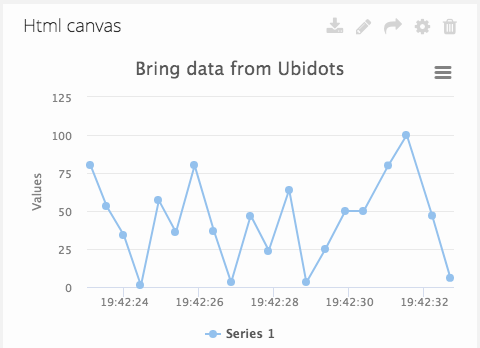 This is the first example showing how to interact with the Ubidots API. The final result of this example will be an HTML Widget capable of sending a value to a Variable. This shows the great level of customization that the HTML Canvas widget could have. This example doesn't contain any CSS code. Here you will need to create an account in Mapbox to get the appropriate authentication KEY and paste accordingly in the JS code. 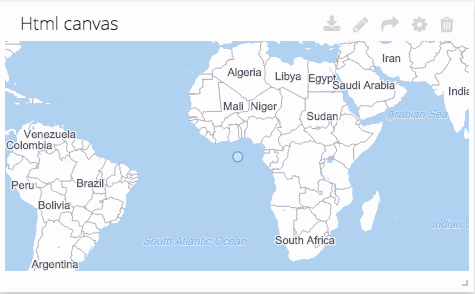 In this example we'll use Mapbox instead of Google Maps, which is the service we use to our default Map widget. The result widget can be seen here. 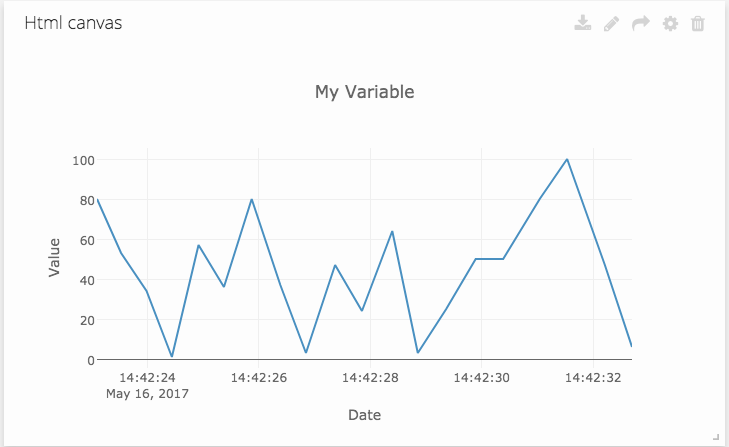 We used a Highcharts implementation before, but what if we want to use another graphing library? It is also possible with this HTML Widget, in this example we'll use Plotly to graph the data of our chart.